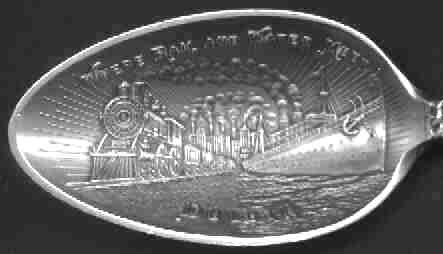 The residents and visitors to Duluth, Minnesota must have been very impressed with their bridge, since it was reproduced on many very beautiful spoons. Apparently this was the first "aerial lift" bridge in the United States. Click for more info on this unique bridge. 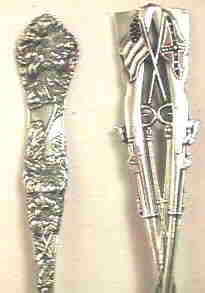 The spoon on the right is known as the Crossed Rifle Spoon. This one features enameled U.S. and Confederate Flags. I don't know why it has the Duluth bridge engraved in the bowl. This is a very unusual and unique spoon. Duluth: "where rail and water meet"